try out Pubopoly, the new board game devised by artist Lucy Schofield for the Geezer’s Where’s My Boozer Gone? campaign, and see how many pubs you can save from the developers. 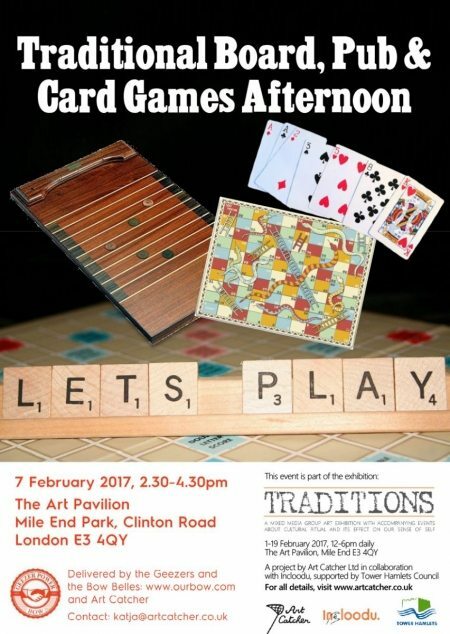 Its all happening at the Traditions Art exhibition at the Mile End Park Art Pavilion next Tuesday (7th Feb) from 2.30-4.30pm. Hosted by the Geezers and Bow Belles its your chance to enjoy some fun and games and refreshments, and take a look round the Traditions Art Exhibition, which features Louise Gridley’s painting of Geezer Ted Lewis along with a host of other interesting artworks reflecting on the nature of custom and tradition. Previous Post:Urgent! Sign the Petition on the Roman Road Tomorrow! Please come along and join us on Tuesday 7th Feb. At Art Pavillion Mile End Park. 2-3- t0 -4-30 pm. Bring along a Game.